To savor your life by sidestepping or reducing opportunities for conflict turn from instinctual defensive or "either/or thinking" to the "and" approach were you can hold apparently conflicting notions in your mind and find a middle way. Lisa makes this concept come alive with examples from the famous and from everyday situations. I've written two books on conflict resolution and read over 50. Lisa writes in a way that can interest even the non-avid reader. She pulls people in with her conversational style. Good read, helps one to develop an open mind. A method to reduce stress and conflict and be at peace.Read it at your own pace, practice it.Basic skills of thorough listening are quite absent with the amount of information passing through our hands and brains. Hence the friction in meetings and stress in arriving at satisfactory-to-all outcomes. This book really has a great idea about instead of either/or thinking, trying 'and'...the world would be a better place if we could do this. My boss loaned this to me, ha. The bottom line: you don't have to look at things with the either/or dichotomy, nor do you have to "settle" through compromise. Lisa Earle McLeod - Lisa Earle McLeod is a nationally syndicated newspaper columnist, business consultant and inspirational thought-leader. 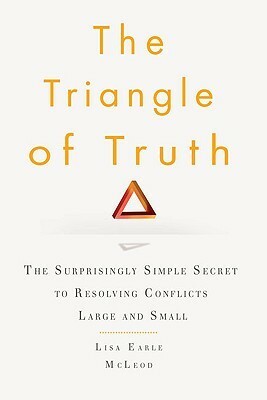 Her newest book is The Triangle of Truth: The Secret to Resolving Conflicts Large and Small (Penguin). She conducts workshops and seminars worldwide and is a sought-after keynote speaker. A repeat guest on Good Morning America, Lisa lectures internationally and lives in Atlanta. Sign-up for her free weekly newsletter at TriangleofTruth."